Make your own painting masterpiece with the help of a few craft pints and step by step, local artist-led instruction. Your $35 ticket includes 2-hours of professional instruction, a half pint beer of your choice and you’ll leave with your own original artwork on canvas. Book with Deli Dogs 🐕 and get a portrait of your pooch at TCBC! Comes with one edited image! In and Out in 15 minutes! Book via our website www.delidogscharleston.com and click the BOOK A SESSION link top right! Join us for our 2nd Anniversary Bash! We've made it another year because of your support! 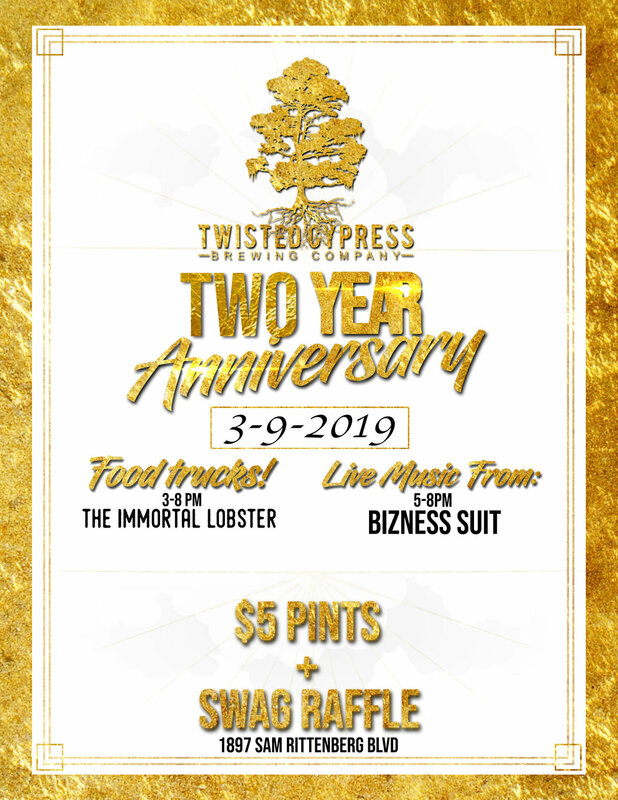 Come enjoy some of our great craft beer while dining on delicious lobster sandwiches from The Immortal Lobster and jamming to tunes from Bizness Suit! Join us for extended hours Sunday while we watch the Patriots play the Rams in the Super Bowl! Pint special - all brews $5 starting at 6pm! Growler fills to go ALL DAY $10! BYOF - or order in directly to the brewery! Parks and Rec Trivia Night! Join us for a special Parks and Rec TV show themed trivia night! No sign up is necessary, just show up and enjoy! Bring your friends and play for Twisted Cypress gift cards! 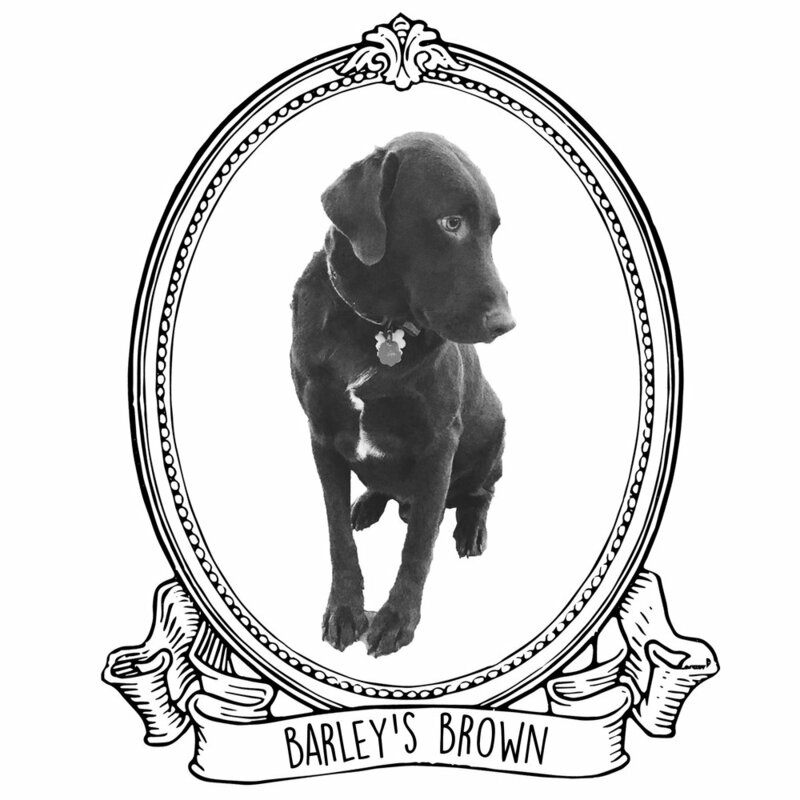 Join us for the release of our newest brew, an homage to our dear Barley the Brew Dog! A smooth Brown Ale with a hint of chocolate from cacao added late in fermentation, balanced with a touch of vanilla. Bring a bag of dog food to be donated to Pet Helpers and receive a FREE pint of Barley’s Brown! And yes, Barley will be present! So bring your furry friend to the event as well! Join us on Thursday, Dec 20th for a nationwide #ResilienceNight! Breweries from coast to coast will be offering up #ResilienceIPA in an effort to raise money for the Camp Fire Relief Fund. Sierra Nevada asked breweries to help out by brewing their recipe and donate the proceeds to help those affected by the Camp Fire. Over 1400 breweries participated, we joined Rusty Bull Brewing Co. Oak Road Brewery Pawleys Island Brewing Company Commonhouse Aleworks and Holy City Brewing in brewing this beer! Stop by all 6 Charleston area breweries to support the cause! If you check in our Resilience IPA you will earn a special Sierra Nevada Resilience badge on Untappd! 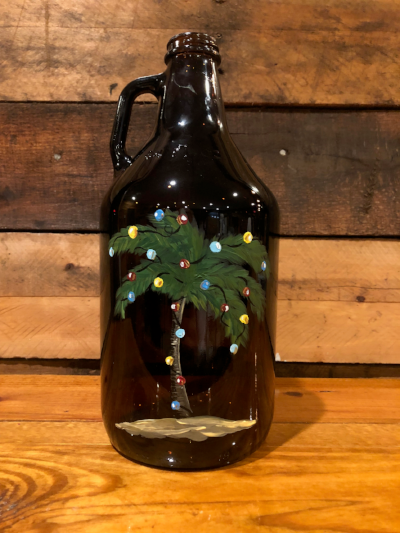 Just in time for the Holiday Season - a festively themed Paint A Growler! Bring your friends and join us for a fun evening of guided instruction toward painting your very own holiday masterpiece! Ticket price includes first drink of choice! Black Friday Special Hours + Savings! Join us for our Black Friday Specials! ALL TCBC Merchandise is 20% OFF!!! Come out and join Paints and Pints Charleston make your own masterpiece with the help of a few craft beer pints and 2 hours of step by step, artist led instruction. Leave with your own original artwork on a growler! Just like the show, The Office Trivia was a hit! So we decided to host a round 2 with NEW questions! No need to sign up, just show up and enjoy! Join us for a fun day of adoption! Come out and meet some of the furry faces in need of a furever home! Charleston Animal Society will be on site with some furry friends that would love to go home with you! Join us for our inaugural Fall market showcasing the amazing talents and skills hidden about our dear West Ashley Community! Pubs used to be a place for locals to go and exchange ideas and stay abreast to local happenings, and in that vein, we aim to unite and promote the community in which our humble business exists! Please note that attendees can park at PLUGS and Caliber Collision, with overflow parking across the street. Paints & Pints Charleston guides you through a fun filled Cypress Tree themed Paint a Growler night for our rescheduled Charleston Beer Week event! $30 includes all supplies, your first pint, and 1/2 off a growler fill so you can take home a little TCBC goodness in your masterpiece! If you have not already, get your tickets HERE! Choose from either theme pictured below! The Golden Pineapple will keep your brain fueled for Mean Girls Trivia! Krystyna's Authentic Polish food brings the brain food for a fun night of nostalgic 90’s trivia! Paints & Pints Charleston guides you through a fun filled Cypress Tree themed Paint a Growler night! Choose one of the two themes below! Our good friends with Krystyna's Authentic Polish Food return with their delicious authentic eats! Blade and Bull Axe Throwing returns! See poster below or event for details! Sezessionville Road returns to TCBC to provide their folksy inspired tunes for your listening pleasure! Caribbean Soul has dinner covered with some authentic eats! Check 'em out! Our friends with Krystyna's Authentic Polish Food bring their AMAZING eats - don't miss this! Who doesn't love the TV show The Office?! Come join us this Friday for The Office themed trivia from Grey Matter Games!!! The Golden Pineapple will be out front with brain food to keep you going from 6-9pm!!! Welcome new newcomer The Golden Pineapple! "A food truck with golden hospitality!" Bring your furry bestie and enjoy happy hour pricing while your pooch enjoys socializing in our fenced in backyard! We have two kiddie pools to keep them cool while they have fun! Please be both mindful and respectful of others and pick up after your pet! FREE live music: Sezessionville Road! Help us welcome Sezessionville Road as they make a tour stop at TCBC for a FREE show! Sezessionville Road is an Americana/Alt Indie/Rock Band from the mountains of Western North Carolina. Check out CHS' newest food truck offering all beef gourmet hotdogs - Bearded Dog! Check out CHS' newest food truck - Bearded Dog! Our friends with The Immortal Lobster Truck return with their signature sammies!